Atellior is an architecture and interior design studio with extensive international experience in the luxury residential and hospitality sectors. Our expertise includes designing contemporary yet timeless and elegant interiors that combined with our wealth of architectural and technical knowledge, provides a complete design service. Our residential projects are located within some of the most desirable London real-estate, including penthouses at One Tower Bridge, Chelsea Creek, and Fulham Reach. Our experience with the leading residential developers Berkeley Homes, St James and St George span 15 years. From design of base-build interior specification, to design and dressing of penthouses and sales & marketing suites we get involved in all aspects of interior design, dressing and styling. At Atellior we understand hospitality and the operation of hotels. We understand luxury and we understand brands. Our wide hospitality experience includes successful interior design and architecture projects with major brands including Four Seasons, Hilton, Marriott, InterContinental Hotel Group, Park Plaza, Carlson Rezidor and Accor, to name a few. Our current projects are widespread across Europe (United Kingdom, Germany, Netherlands, Croatia, Bosnia and Herzegovina, Serbia, Lithuania) and range from 5-star luxury resorts, through to 4 and 3 star branded and non-branded city hotels. Each project is approached with a fresh, clean canvas, drawing inspiration on current and historical site context. Our ultimate goal is to bear in mind both client requirements and end-user experience throughout our design process. Una Barac is the Founder and Executive Director of Atellior, the architecture and interior design studio. Atellior’s recent projects include: the Park Plaza, Nuremburg; the Four Seasons resort in Hvar, Croatia; the Sales & Marketing Suite at historic Trent Park; the refurbishment of Park Plaza County Hall in London; the new restaurant at Art’otel Cologne; the refurbishment of Park Plaza Hotels in Utrecht and Eindhoven, Netherlands; Courtyard by Marriott hotels in Split, Croatia and Vilnius, Lithuania; Swissotel and Sofitel M Gallery in Sarajevo, Bosnia & Herzegovina and the new Park Plaza Hotel in Pula, Croatia. Una started her career at Foster + Partners where she worked for seven years. Prior to founding Atellior Una had worked for Scott Brownrigg for fourteen years where she headed up the Hospitality Sector and led the London and Croatian teams to design and deliver a number of successful projects. She led design and delivery of interior design at Hilton Bournemouth, funded by the founder of Ted Baker. Una also ran a number of high profile schemes for Berkeley Homes, including Chelsea Bridge Wharf, Goodman's Fields, 250 City Road, South Quay Plaza as well as The Corniche for St James. Una led projects for both the Park Plaza Nuremberg, Germany, which was shortlisted for the Mix Award, and Art'otel Mitte, Berlin. They opened in 2016 and have received very positive publicity in a number of hospitality and design industry leading publications, including Sleeper Magazine and Wallpaper*. In 2012 Una led the award-winning design of the “Shaded White” Bedroom which won the Sleep 2012 Best Hotel Room Design Award against strong international competition. In addition she led the team which designed the Park Plaza Histria Pula, a finalist at the 2013 European Design Award, for Best Hotel Spa. Una oversaw the openings of seven hotels and resorts in five short years in the Adriatic region – Sheraton Dubrovnik Riviera, Karisma Adriatic Beach Resort, Boutique Hotel Mlini, Park Plaza Histria, Park Plaza Arena, Courtyard by Marriott Sarajevo, public areas of Marriott Residence Inn. Three of these were selected as finalists for the Adriatic 2015 Best New Hotel Award. Una leads the creative design process within Atellior and is currently working on a number of exciting schemes including; Courtyard by Marriott at Heathrow, Holiday Inn at Gatwick and Manchester Airport, DoubleTree by Hilton in Cardiff, Park Plaza County Hall refurbishment and Hampton by Hilton in London along with a number of Marriott, Park Plaza, InterContinental Hotel Group and Accor projects across Europe. She’s also leading the design on two lifestyle hotels in London and Birmingham, as well as a number of high-end residential projects across London. 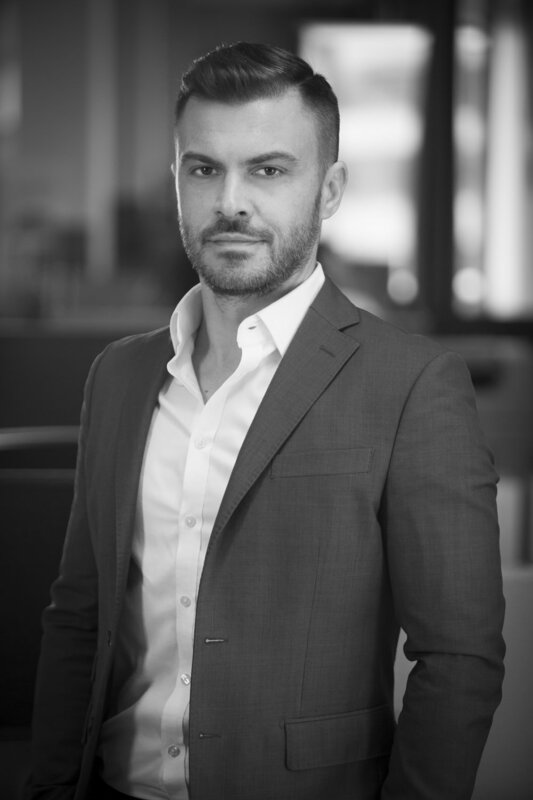 Ante is Managing Director of Atellior. Ante’s rich hospitality experience includes wide range of various scale international projects where he performed roles of Lead Architect, Project and Design Manager. Currently being in charge of a number of hotel and resort projects across Europe Ante gets involved in all aspects of feasibility, architecture and interior design through to overlooking production of the construction information. In 5 years together with Una Barac, Ante has completed over 10 hotels and resorts in the Adriatic region and Europe. Three of them were selected as finalists for the Adriatic 2015 Best New Hotel Award and Park Plaza Nuremberg is currently shortlisted for various design awards.